In this edition of the “Why I Bought It” series, I hope to give you a good impression about why I chose this watch among the many ultra-complicated chronographs out there, why I’m still pleased with my purchase three years later, and what you might want to consider if you think that this stalwart of the Lange line could be the one for you. In my friend Terry’s collecting taxonomy (described in more detail in Why I Bought It: Vianney Halter Deep Space Tourbillon), the Double Split definitely falls in the “investment” realm: a piece with fairly predictable market value that is important in its own right and can be a foundational element within a collection. One of the great things about these sorts of watches from a collector’s perspective is that they allow you to spend (note I didn’t say “invest”) more on your collection than you could otherwise afford. Our small group of Northern California collector crazies had gathered for one of our regular lunches, this time with a Lange theme. As usual with our group, any theme teases some pretty interesting watches out of members’ safe deposit boxes, and this time was no exception. Pieces like one of the ten “Pisa” Datographs in existence and a rare Lange 1 in stainless steel were being handed around and tried on. The “Pisa” is an edition of ten pieces in platinum cases with both solid and exhibition case backs, a silver dial, and blued chronograph hands; they were made for the Italian retailer of the same name. For me, though, the watch that riveted my attention didn’t actually belong to any of the members; it was a Double Split that belonged to the uncle of one of our gang. Turns out that “Unc” was in town for the day, met up with our buddy, and – by total coincidence – happened to be wearing a Double Split. He was kind enough to lend it to his favorite nephew for lunch. It is on such small coincidences that collections can turn! My photos from that day are dominated by the Double Split, and I was soon on the hunt. Shortly thereafter, I found a suitable example at auction, and after some much-needed loving care back at the A. Lange & Söhne manufacture (which I reviewed in some detail in Why You Can’t Afford To Buy Your Watch If You Can’t Afford To Break It) found myself with a like-new Double Split that has been one of my very favorite pieces ever since. The reasons why I love this watch fall into two main categories: how it looks and what it does. Let’s start with appearances. · It is indeed mighty! The massive platinum case is both hefty and sculpted in ways that to me communicate a real seriousness of purpose. One example: on the rear bezel, the brand name and serial number aren’t just engraved; they are etched into the bezel in deep relief, providing a striking frame for the movement. · Speaking of the movement: even if it weren’t a mechanical marvel, it certainly looks the part! 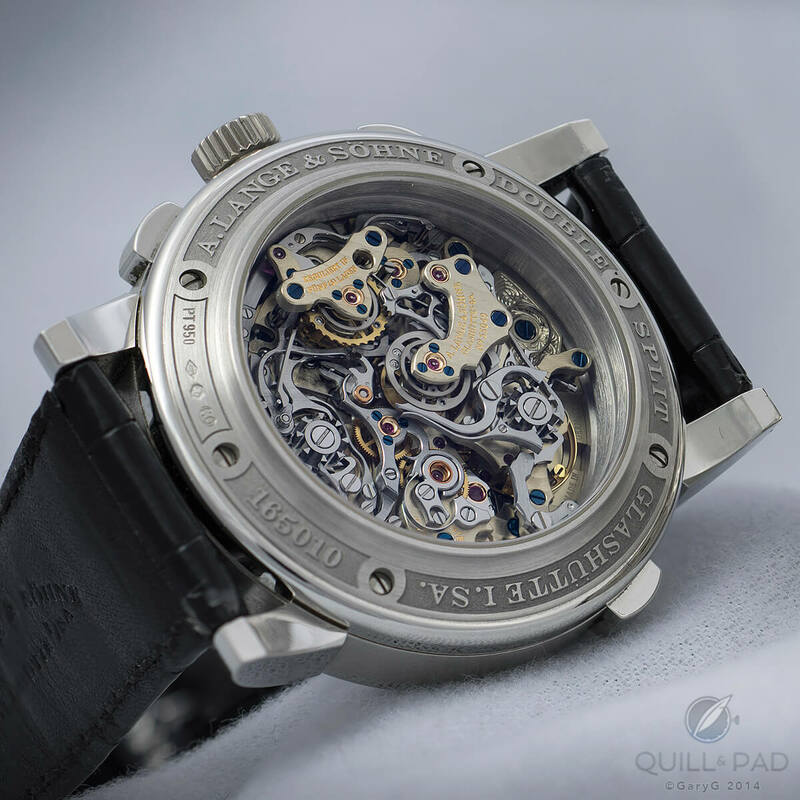 The term I’ve heard over and over again from first-time viewers of my watch is that the movement side looks like a “city under glass.” Lange’s practice of building chronograph complications vertically isn’t to everyone’s taste, but I’m a sucker for this sort of deep dimensionality. · The finishing is both purposeful and beautiful. A term that I sometimes use to refer to Lange’s style of finishing is “vigorous”: those Glashütte stripes on the bridges, for instance, will never be mistaken for the barely-there striping applied by Philippe Dufour. But for me it’s all part of a coherent Saxon style, like the screwed gold chatons that secure some of the jewels. It is especially appropriate for a masculine watch like the Double Split. A. Lange & Söhne Double Split movement detail: can you count the number of different finishing techniques? · A lot of thought was obviously given to the dial side of the watch as well. One thing that you can see when you run the chronograph is that the little diamond-shaped opening at the bottom end of the chronograph second hand perfectly frames the central axes of each of the subdials, including the power reserve, each time it swings over them. Of course, that’s not just a matter of cosmetics; I’m sure it wasn’t that easy to develop the movement architecture so that those three axes were all equidistant from the center of the dial. · Applied Roman numerals? Check. Pleasantly busy Lange-style tachymeter and seconds track? Check. Luminous dots seamlessly integrated into the outer tips of the applied baton markers for the hours? Check. Even the power reserve, which in pictures looks a bit small, seems in proportion when the watch is seen live. · White metal, black dial: while the platinum Datograph is perhaps the leading exemplar of this motif, for me the Double Split is very, very close behind. · Outstanding pusher feel on both the start-stop and return-to zero functions. · A design that seems to reduce any jumping on start-up or jittering of the chronograph second hand virtually to zero. · If you wish, it flies back to zero without having to stop the watch and stays zeroed until you release the return button, at which point it begins to record time again. · Instantaneously jumping chronograph minutes. Not continuously-creeping-along-with-the-advancing-chronograph-second-hand, not even Frédéric Piguet 1185-style, semi-instantaneous changes that creep a bit starting at about 57 seconds and then tick over, but rather crisp, snapping changes perfectly coordinated with the chronograph second hand. 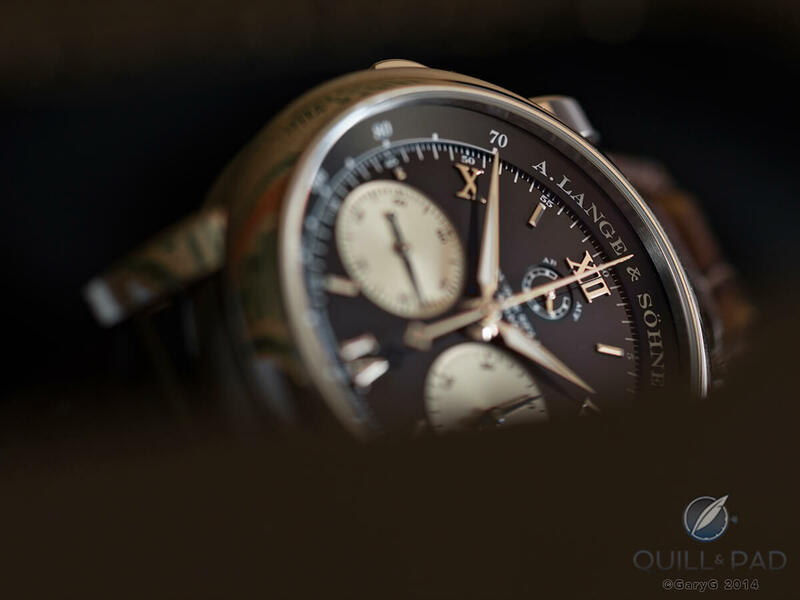 · The A. Lange & Söhne Double Split does all of this not once, but twice! The “split” part is the rattrapante mechanism that uses two chronograph second hands to allow capture of intermediate intervals like lap times; the “double” part is that this same function has been applied to the chronograph minutes as well – the only wristwatch in existence that allows split timing of intervals up to 30 minutes. And all the while, there’s no drama, no anxiety about whether the hands will snap precisely back to zero when actuated, and no sense of fragility. · Like me, you view it as one of the great watchmaking accomplishments of our time. · You either don’t yet have a “dress” chronograph or, alternatively, have a collection that focuses on non-sporting stopwatches like this one. · You can wear it comfortably. I don’t have a large wrist, but I do have a wrist with a broad and flat top surface; this trait allows me to wear big watches quite well, and despite its heft the Double Split wears beautifully for me. · You love the way it looks; not just the dramatic movement, but the characteristic Lange-style dial that you will be looking at most of the time. · You try on the Double Split (which you should definitely do before considering a purchase) and its size, weight, or the way it sits on your wrist just don’t suit you. · You understand all of the potentially interesting things that this watch can do, but don’t see why anyone needs a watch that does them. · You already have another couple of high-end dress chronographs that you can’t bear to part with, and at the same time have other significant gaps in your collection that you are looking to fill. To my good friends at A. Lange und Söhne: how about a Dato Double Split? Yes, I know you’ve already told me that it can’t be done for a variety of reasons, but I have faith in you! How about adding a big date to the A. Lange & Söhne Double Split? *This article was first published on September 30, 2014 at Why I Bought It: A. Lange & Söhne Double Split. You may find the comments there interesting. I like the pros and cons. I have a Dato Up/Down PT but even the Double Split is not on my short list I always had a soft spot for it. Size will be a question for many (for me will be ok). I would definitely recommend PT and not Pink Gold.